LOL! 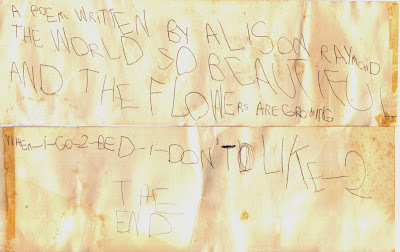 That is really sweet, Alison! You were a brilliant writer even then…now what is the symbolism of the numeral 2’s rather than having them written out…hmmmm… smiles! I hope 2 be that good some day. One–oops, “1” can only aspire. If you haven’t had a chance, you might look at David’s last comment on the last post. It’s the greatest. Nice pun Alison! I was better off before I knew the trurh about Will – no offense intended – it just makes things a little strange when you find out that The Greatest American Hero is actually a gun carrying Christian romance novelist. LOL! Poetic talent obviously runs in the family… smiles!